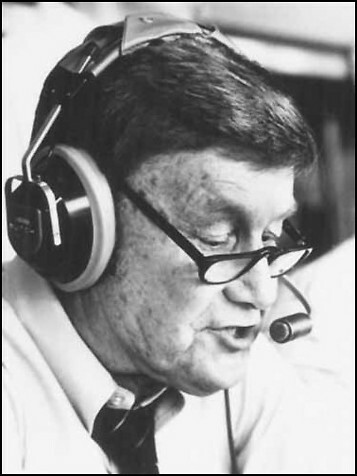 When I heard Larry Munson died Sunday night, my first memory of his distinct voice was listening to the 1981 Sugar Bowl on short wave radio in the wee hours of the morning while living in England. From that moment on, his signature calls were imbedded into my consciousness every time I thought about some great play in Georgia football history over the last 30 years. One of my favorites was one of his worst calls when it comes to radio play-by-play 101: when Kevin Butler’s 60-yard field goal stunned Clemson in the last few seconds of the game in 1984. I was raking the leaves with my dad in our backyard and we were listening to the game – and we rushed over to the radio after Butler’s attempt, begging Larry to tell us if Butler made the field goal or not. We finally celebrated once the result of the kick was finally revealed. However, my favorite personal moment with Munson came in 1995 when I was writing a day-in-the-life story on Georgia basketball coach Hugh Durham in what would be his final season as the Bulldogs head coach. I followed Durham around all day except for a 90-minute film session about three hours before tip-off of the Dawgs’ game against Auburn. Durham told me to go kill some time by talking to Munson. There was hardly anyone in Stegeman Coliseum when I left Durham’s upstairs office and headed toward the court. Just a few trainers, maintenance personnel, ushers – and Larry Munson. He sat at his mid-court seat on press row, poring over game notes and media guides in preparation for the game. If you ever met Munson, you’d know that his charm and charisma were reserved for his radio audience only. Curmudgeon is a better way to describe him. And it only made his storytelling ability shine. But never shy about talking with anyone, I pulled up a chair beside Munson, which visibly ruffled him. I’ve learned a long time ago that people love to talk about themselves, and if you want to get a good conversation going, invite people to talk about themselves. So, I did – and Munson started talking. I asked him about how he got started in broadcasting since I was more or less starting out in my own journalism career. Everybody started somewhere and they always started at the bottom. For Munson, the bottom was Devil’s Lake, North Dakota, in a radio station that was located in a woman’s house in 1945. He went to great detail to describe the location of the bathroom in proximity to his door-less “studio”. At first, I thought it was just a humorous detail until he continued telling me the story. Munson said he took his job very seriously, even though he knew it was in “the middle of #@!#% North Dakota.” But he said the station owner made it difficult on him. Every morning at 7 a.m., Munson read the news, sometimes somber reports about things that were going on in the world at that time. And every morning at 7:02, he said the station owner would flush the toilet and immediately open the door from the bathroom, allowing the ambient sound of a toilet swirling home its contents as a backdrop for serious news. Then she would shuffle by in her robe and slippers. There was still disdain in his voice for that woman 50 years later. His nostrils flared and his voice raised as he related the story to me, showing just how much this daily occurrence irked him – maybe as much at the moment he told me as it did back then. He was a gracious host of my intrusion into his pre-game routine as we sat and talked for about an hour. He shared plenty of stories about people he worked with and amazing moments in broadcasting, but nothing captured his love for his work like his story about his first job in journalism. I’ve missed Munson for years now, even as his play-calling in his latter years were rough on the ears. But his passion for the Dawgs is what will forever endear him to all Georgia fans. Finally, no tribute to Munson would be complete without arguably his most famous call in the 1980 Georgia-Florida game.